A brief about simple past tense for UPSR students. 1. We use simple past – of be – to talk about fact about the past. Tun Dr. Mahathir was the Prime Minister of Malaysia. 2. We use simple past – of be – with place and time. We were at Singapore in December. 3. We use simple past – of be – with adjective. The bus was late again this morning. 4. We use simple past to talk about action or situation in the past which is finished. Ali phoned me last night. He wanted to ask me about school homework. 5. We also use simple past to talk about something that continued for a period of time, and ended in the past. Last month, Abu stayed in Kuala Lumpur for five days. (+) I played football. → (-) I did not play hockey. (+) He saw you. → (-) He did not see us. (+) Siti went to Rome. → (-) Siti didn’t go to London. (+) Ali cleaned the car. → (?) Did he clean the car? (+) The team went to London. → (?) Where did they go? The AzZahra Kids English Programme is a complete and systematic programme with the goal of helping children to read well from a young age. With the tagline “Reading is Fun”, the programme applies the phonics technique. The children learn best when they are having fun. That is why we design special classroom activities that apply fun and creative approach towards learning. These activities will not only make reading a joy but are also improving children language skills. 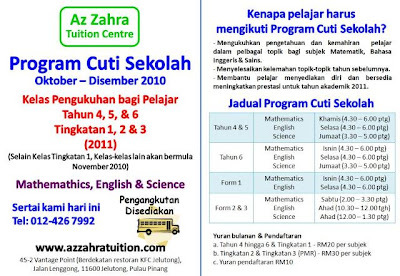 The AzZahra Kids English Programme is specially designed for children as young as four years. It comes in 4 comprehensive levels that can be continued until the children enter their Primary School Years. In additional, it is reasonable for lower, middle and upper income groups. Would you like to help your child go beyond singing the ‘ABC’ song? When your child is three or four years old or whenever he or she is starting to recognize that letter have names and sound, there is so much discovery! AzZahra Kids English Programme helps you as a parent do more than just pass on a love of reading. We make it easy for you to play a role in helping your child understand the building blocks to reading itself, all while having fun together! c) Play fun games or read great books to apply and reinforce new knowledge. Assessment: Your child will be evaluated on their performance in listening, reading and speaking tasks. At the end of each course, your child will be given a progress report, which is based on specific learning outcomes. 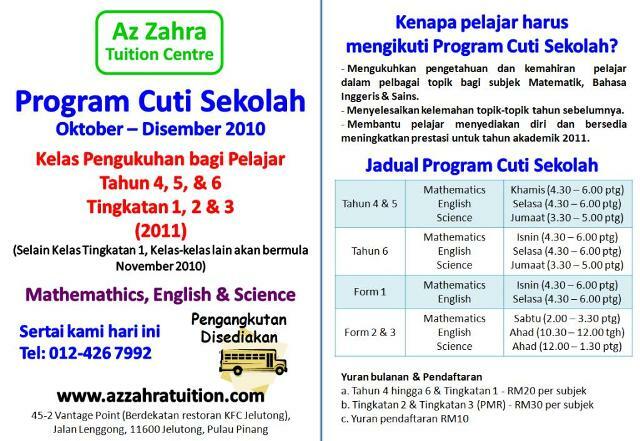 Registration: Class size is limited to about twenty students, so reserve for your kids now.